Over the holiday we had changed the plan for sailing back. 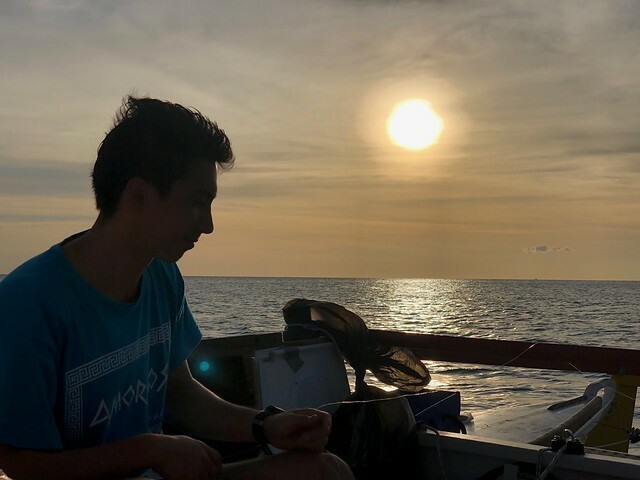 When sailing to Pandan Island we realised that there is no cellphone provider contact over a distance of around 60 nautical miles around Calavite Point. It is a national park and there are no residential areas, except for a few small fishing villages along the shoreline. On the way back we would therefore have to tack against the wind and high waves without any means of communication. Having a not so reliable and too small engine the thought of drifting out in the open sea in case something went wrong was not a comfortable one. So we decided to sail around the southern tip of Mindoro and then up the west coast to Calapan and then back to Puerto Galera. There are villages and plenty of bays for seeking shelter all along the southern and eastern coast and we assumed that therefore we could expect cellphone connectivity along the whole trip. But, this southern route is twice the distance, so we were expecting it to take 4-5 days to reach Puerto Galera. Radek had offered to join the sail, but had to take a group of guests from Switzerland to Busuanga and would only be back on January 6. Martin had to be back in the office by then. So we decided to try the sail without Radek. Gael had expressed interest to join and then leave us in Puerto Galera and then hike to Abra de Ilog from Puerto Galera, so he completed the crew. At six in the morning we see Mavic and the Ballies off to the boat that brings them to Sablayan. Our own departure time was scheduled for 7:00, so we had time for a last proper breakfast in the Pandan Island restaurant. Martin picked up the second outboard motor tank, which was filled up with 15 liters from the resort’s supplies. Yesterday Gael had bought a fruit basket, fishing gear and a huge straw hat, which also needed to get loaded on board. Two additional 10l drinking water bottles were stored in the bilges. So we should be good with respect to supplies. We raised anchor and set sail straight away at 7:30. The wind was favorable and we made good speed southwards on a beam reach. After lunch time there was the usual drop in wind and we ran the motor for half an hour. Then the wind started blowing again, quite gusty, and a gust picked up Gael’s straw hat and carried it overboard. We discussed the maneuver to recover it, which distracted us from getting prepared for the next gust. 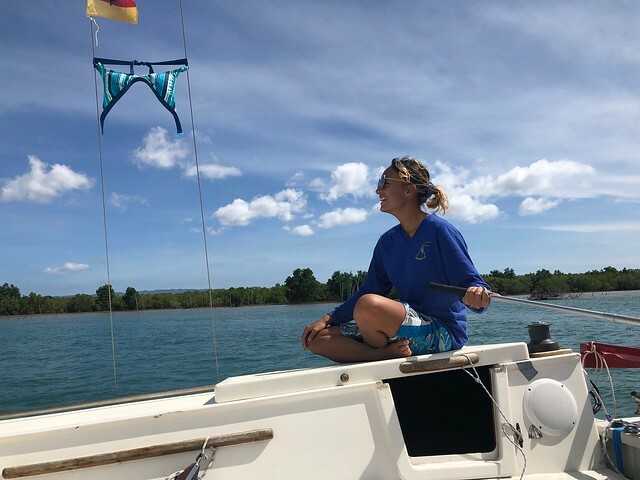 When we saw the ripples in the water there was not much time to react, it quickly hit us with wind coming from a different direction, and after a bang the main sail was flopping loosely on starboard, the sheet detached. Martin thought the sheet-shackle had opened, which happens sometimes with the jib sheet, but a closer inspection showed that the whole clew had been ripped off. 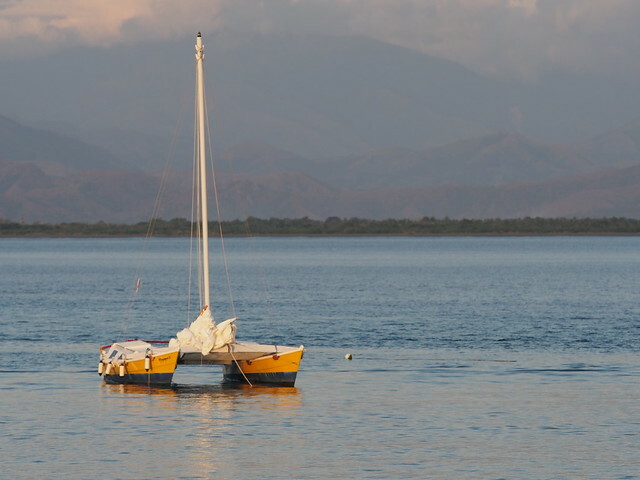 Gael recommended a shallow beach close to the San Jose airport as good anchoring ground. That’s where Pandan Island’s dive boat had dropped us 15 years ago or so to catch a return flight to Manila. We arrived in the vicinity in the afternoon but did not find the exact location. So we dropped anchor on 5m depth around 100m off a beach with some buildings and access to the national road. In the process of dropping the anchor Martin must have accidentally pressed his Apple Watch button for longer than 3 seconds so an emergency call was initiated that caused some concern with Mavic. Pretty useless new technology. 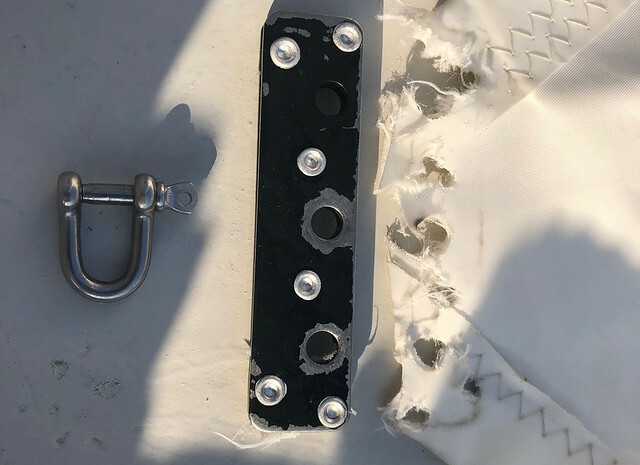 We tried to fix the sail with the onboard sail repair kit, but the needle broke immediately. With the cordless BOSCH drill we had bought in Sablayan to repair the rudder we were able to remove the rivets from the clew. Gael then swam to shore with a sample screw and nut and the task to find 8 similar pieces, and some beer for sundowners. But before diving into the sea he set up the stove to cook rice rice for dinner. After all we are in the Philippines. 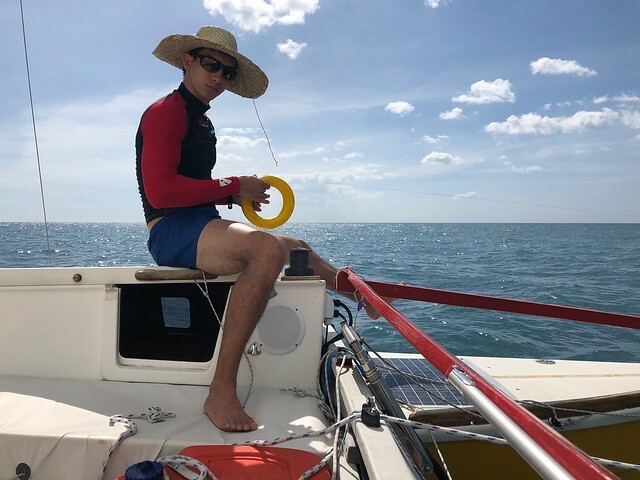 An hour later Gael returned, with the screws, and two Litro San Miguel bottles and we managed to do an emergency repair of the sail before sunset. This looked solid enough for continuing the trip. A simple dinner with rice, spicy sardines, sausages and the SMB followed, after Miriam had sacrificed the first sip of her beer as Ankerschnaps to Neptune. After an uneventful night we raised the anchors at 6:30 and set course to San Jose, where we beached Magayon II close to the city market to re-fuel and to get some more water. Martin dropped the aft anchor and some helpful guys on the beach tied the mooring line to the outrigger of a bangka sitting dry on the beach. Magayon was quite an attraction drawing a crowd of spectators. Martin grabbed the empty tank, got a tricycle and went to the PETRON station. He was not aware that his Apple Watch was still sending emergency calls every time he changed location and thus Mavic got several confusing emergency texts, the last one from the PETRON station. The station had a small shop so he also bought two 10 liter water bottles, and was back on the beach within 20 minutes. In the meantime there had been some problems with the anchor. When Miriam tried to take the anchor line closer, all of the sudden she had the end of the line in her hand. Obviously Martin’s Palsteg done early morning after raising the anchor was faulty. The situation was quickly under control since the guys on the beach held Magayon in place while Gael went for the goggles and recovered the anchor. No big deal, but a reminder to be more alert in the future. We had switched tanks for the re-fueling and set course south but then the motor died shortly after raising the anchor. Several attempts to re-start it did not work, and we were starting to drift towards a larger boat. No wind to leave with the sails, so Martin dropped the anchor back into the water. Lots of helpful advise came from the shore. “Check the spark plugs.” “Check ignition.” “Do this,” “do that.” One guy came over on a raft and offered more advise. But in the end it was bubbles in the fuel line of the new fuel tank that had caused the problem. So finally we left the beach with engine power and set sails, 2nd reef in the main. Course was set South towards the open sea through the Ilin Strait. We had to tack once because we came too close to the luff side of the Ilin Island, giving us a pre taste of the tacking that will be required once we are around the Cominauet point. Today we wanted to reach Bulalacao Bay, close to a new resort where a German woman is operating Kitesurf Mindoro. The closer we got to the Cominauet point and the open sea, the stronger the wind blew and the higher the waves built up. Once around the point we had to change course into the wind against the full blow of Amihan. We tried to tack, but this took us very far away from the shore and wind and waves even increased further the more distance we got between the shore and Magayon II. We wanted to stay close to the shore since waves were much lower and wind force lower because of the protecting Mt Alibug far ahead of us. So we tacked back to the cost, and realizing that we had made very little height, lowered the jib and tried to motorsail close hauled against the wind. At around 90% motor power we were only making around 1 knot speed and by lunchtime had made very little progress. A quick check of the map. It was obvious that after passing Buruncan Point we would face the headwind unprotected by mountains and most likely much higher waves. It was doubtful that we could reach Bululacao today at this speed. To reach another protective bay we would have to do a big detour. We did not feel unsafe at any point so far but given the previous problems with the overheating outboard motor and the damaged sail we thought that safety-wise it might make sense to wait for a time with less wind. A quick discussion of the situation and options, after which we decided to return to Pandan Island and discuss alternative options there. Greater people than us, like Ernest Shackleton on his Antarctic expedition, had turned around without shame, so nobody on board felt bad about it. Magagon II, now in her element, was flying back, just with the main up with second reef we made 7 knots and more. Within 30 minutes we had covered the distance for which it has taken us most of the morning. After Cominauet point we continued a good run on a beam reach going back North and this time found the anchoring grounds Gael had talked about. We anchored around 30m off the shore with two anchors and swam to shore to have a late lunch and some beers. Gael bought a replacement straw hat and with six bottles of San Miguel we swam back to the boat for a nice sunset. Friends were updated about the changed plans (Radek: “Sehr schön, Workshop action, looking forward! “) and first ideas for a later return outlined. Gael called Pandan and reserved a budget room for two nights. A highlight of the evening was a FaceTime call from Helmut and Edith to exchange new years wishes. Amazing impact of the use of new technology. 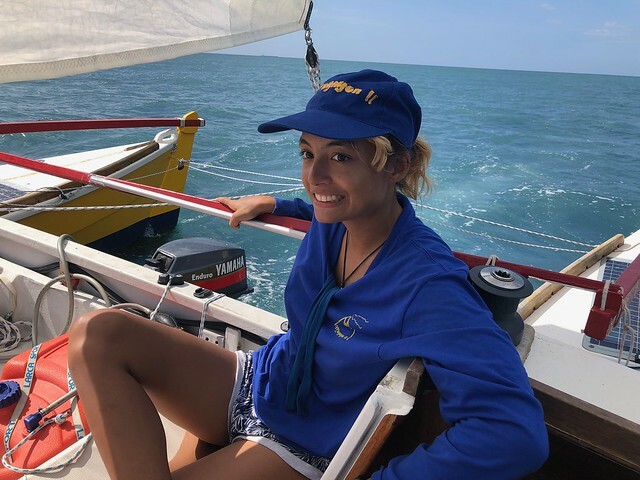 Sitting on a self built catamaran using traditional Polynesian boatbuilding concepts in the Philippine sea while having a video call with the parents / grandparents back in Germany. The sail back to Pandan Island was easy. The first half close hauled with around 4 knots, the second half with more favorable wind and slightly higher speed. We had to start the motor a few times, but only for a few minutes or to reef or take reefs out. 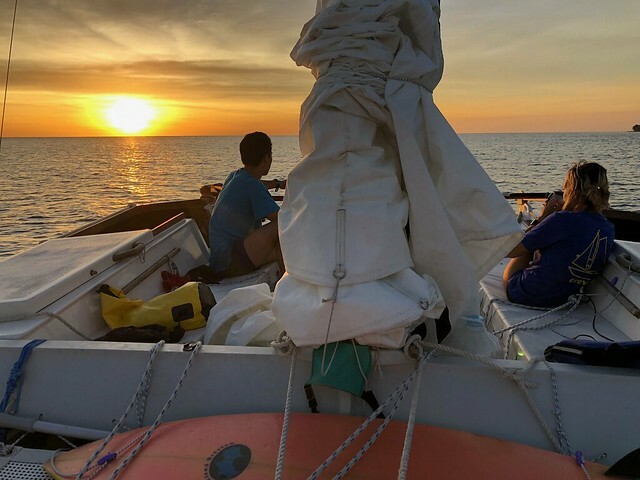 We hoped to make a dramatic entry under full sails into the channel between Pandan Island and Pandan South, but unfortunately the wind had turned again and was facing us head-on in the channel, so we had to motor into the channel if we wanted to arrive at daylight. We dropped Anchor on the turtle grounds and were picked up by the dive catamaran. Sundowners at the Pandan bar, Funky and Rose were still here, and then a nice buffet meal finished the day. Option 1: Wait for times with less wind. This would be most likely April / May, we would need a safe place to leave Magayon II, e.g. in the river bed in Sablayan. Option 2: Buy a bigger motor and try again. This would take some time to get the motor, reinforce the bracket. And Martin won’t have time for a longer trip. So this would need more adventurous crew. Option 3: This would be Option 2 but use the northern route. Maybe instead of going to Puerto Galera we should go straight to Nasugbu. Less tacking against the wind and we want to take her out of the water anyway for repairs and new anti-fouling. 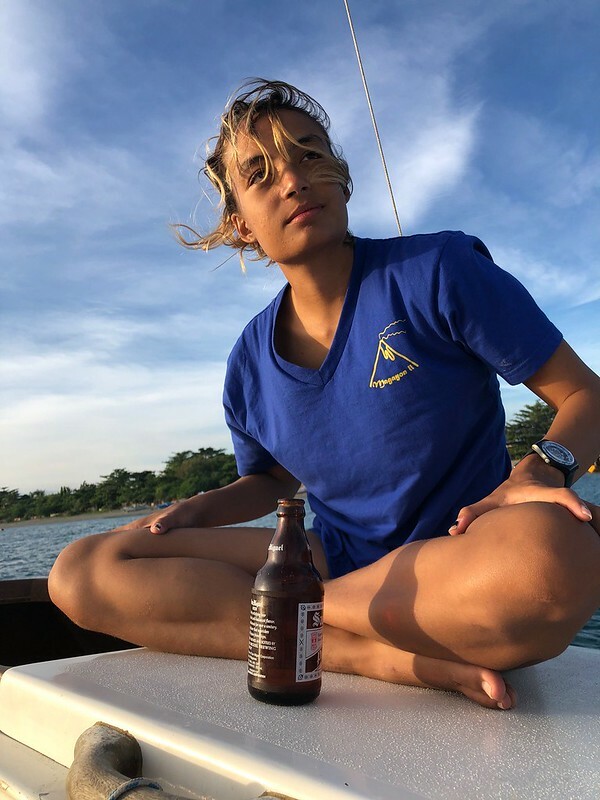 Miriam could stay in Pandan Island and do some work on the boat and run sunset tours for tourists to practice her sailing skills while waiting for one of the options to get realised. What a terrible destiny to be stuck on a tropical dream island. We then we to Sablayan to buy materials for strengthening the bracket. Yama hardware was closed. We decided to indulge in a lunch meal at Jolibee instead and then checke out the bus schedule at the terminal for Martin’s trip back to Los Banos. Back on the island Martin draw some sketches for reinforcing the outboard motor bracket and we also moved the boat since the Captain of Klara found our anchor too close to Clara. We also changed the hight control of the outboard motor to reduce the torque on the aft cross beam during operating the motor, and tightened all the crossbeam lashings. Martin went to town to buy the parts, this time successfully, and to get a haircut. After that we took Magayon II for a spin using to motor at full power to test the modification to the motor height adjustment. It worked as expected, but for a stronger motor more changes would be needed. During sundowners we discussed our options with Radek, who had returned from the live aboard trip. He offered Miriam his guest room for some time, which we highly appreciated.